Promedior is a clinical-stage biotechnology company pioneering the development of targeted therapeutics to treat diseases involving fibrosis. Promedior's proprietary platform is based upon Pentraxin-2, an endogenous human protein that is a monocyte/macrophage differentiation factor specifically active at the site of tissue damage and works as an agonist with the potential to both prevent and reverse fibrosis. The lead product candidate is a recombinant form of human Pentraxin-2 called PRM-151. 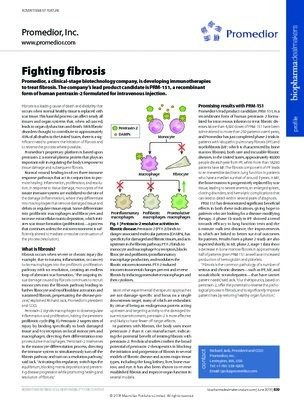 By acting as a master regulator upstream in the fibrosis cascade, Pentraxin-2 therapeutics harness the healing power of the innate immune system and open up new opportunities to treat a wide range of systemic fibrotic diseases for which there are no approved therapies. PRM-151 has been shown to be generally safe and well-tolerated in healthy volunteers and in idiopathic pulmonary fibrosis (IPF) patients, with some encouraging exploratory efficacy signals seen in IPF. Clinical development is continuing in IPF as well as in myelofibrosis, currently in a Phase 2 study.